Darkened stretch marks usually appear when your skin has been stretched and damaged, usually following a rapid weight gain or pregnancy. Stretch marks usually appear on areas where fat is stored or which have a tendency to stretch e.g. stomach, buttocks, arms & hips. 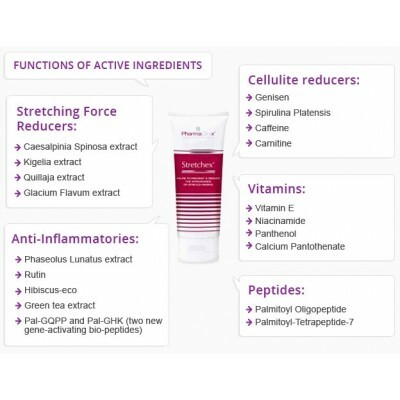 Asians, Africans & other Ethnic groups suffer with particularly bad stretch marks, which need higher strength of combination of Actives to make a real difference. Can Stretchex treat old silvery, white stretch marks? These white, silvery lines are actually scars left behind by red/purple stretchmarks that you had. You have to make these white marks into red ones using a Dermarollex (0.5mm) before applying the Stretchex® cream. Can Stretchex treat red/purple stretch marks and prevent them in pregnancy? 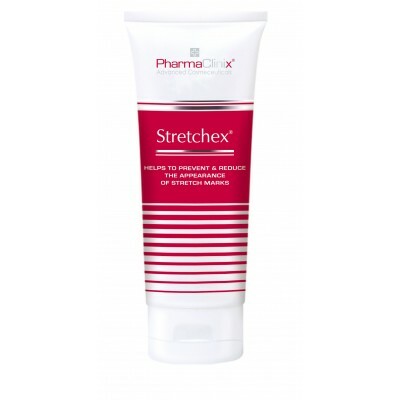 Yes Stretchex® cream is exceptionally good in prevention and treatment of stretch marks. Is Stretchex safe in pregnancy/breastfeeding? Yes it is perfectly safe in pregnancy & breastfeeding. Is Stretchex safe to use in teenagers? Yes it is safe & highly effective in teenagers. Massage twice daily, particularly during pregnancy or periods of excessive weight gain or loss. Using circular and upward movements, gently massage into areas of body prone to stretching; e.g., the stomach or thighs. Sub cutis (the inner layer of skin, consisting of fat and connective tissue). Stretch marks occur in the dermis, when the skin is pulled beyond its elastic tolerance resulting in tears of the dermis. Stretch marks are a form of scarring on the skin with an off-colour hue. Stretch marks occur when the skin is pulled by rapid growth or stretching. Although the skin is usually fairly elastic, when it's overstretched, the normal of collagen (the major protein that makes up the connective tissue in your skin) is disrupted. There is bleeding into the skin, which causes the redness in the stretch marks. 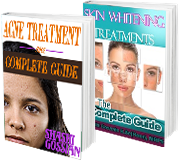 There are tears of the dermis and over time these can diminish but not disappear completely. Growing adolescents can get them on their backs, with the appearance of a series of horizontal lines. When these red stretch marks become white, then scaring of this tear is complete and stretchex® on its own will not help. It requires dermarolling to induce bleeding into the valley of the tear before strechex® can be effective.